Blogging real life. Living on Purpose. We have been long anticipating the day when our whole family could visit with Sangeetha and her family. We have been sponsoring her since s he was about 8 years old, and she is now 12. Maddie, Rob and I had the opportunity to visit her back in 2006. The visit with her family was one that marked me forever. 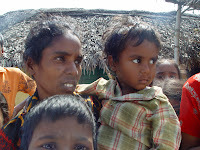 The photo on the right is of Sangeetha’s mom and baby brother from our first visit. I don’t even know where to begin telling the story of this day. There are so many emotions mixed up in my head, I think it will be a long while before I get it all sorted out. We started our visit to Sangeetha’s school where she attends the Compassion project. She has grown about a foot since we last saw her, and I noticed she has also grown in confidence. She wasn’t sure whether to hug us or shake our hands, but there was joy in the room, that’s for sure. Sangeetha went to get her little sister Chandra from the government school across the street while we waited for her. The girls were so happy to meet them both. We pray for Sangeetha and her family as well as the rest of our friends in India almost every night when we are tucking the girls into bed. Meeting her for the first time for Whitney was a very special occasion. For Maddie and Sangeetha it was a meeting of old friends. Sangeetha wanted to take us on a tour around her school, and we were quickly mobbed by her friends, about 100 of them crowded around the girls. It was almost scary because a lot of the younger children were being squished, pushed, and knocked over. They giggled and laughed and practiced all their English sentences they have been working on at school. Truly beautiful children. After we spoke with the administrator for awhile, we loaded up in our van and headed to Sangeetha’s house. We had gifts for her, her Mom, sister, and little brother. I was looking for the little brother and didn’t see him, so I asked where he was. Her Mom pulled a photo of him off the shelf and said that he died exactly one year ago yesterday. I was so deeply heartbroken. I was completely unprepared for the shock of that news. We write letters back and forth to Sangeetha but she did not tell us of this news. I am still reeling from the shock. When we visited last, we noticed how sick Sangeetha’s brother was. Her sister Chandra was very sick too, but has recovered well. Gene Ort decided on the spot to sponsor Chandra, since she does not yet have a sponsor. There are 18 more children on the waiting list at this particular school. There are 8,000 children in Tamil Nadu that are living in poverty that could die of curable diseases like Sangeetha’s baby brother if they are not sponsored. Have you done anything to help the poor and the needy lately? Your small sacrifices will make an enormous impact in lives such as these. I feel like I am stuttering, I don't know what to say. How - what - ugh! It's just horrible! But you are right, that baby is with Jesus now.